After 2,550 years... JEWS ARE A NATION AGAIN!... Prophecy Fulfilled? Are we ignoring THE GATHERING STORM? God uses leaven to symbolize sin, I Corinthians 5:1-8. Sin puffs us up and grows with in us spiritually just as physical leaven puffs up bread dough. God uses unleavened bread to symbolize a sinless life. God tells us we are to put leavening agents as well as any leavened product out of our homes by the First Day of Unleavened Bread and keep it out for seven days. We are not to eat leavened food during the Days of Unleavened Bread. Exodus 12:15-17; Exodus 13:6-7; and Leviticus 23:6-8. To understand exactly what is included in the leaven we are to avoid during the Days of Unleavened Bread, we must understand what is meant by "leaven". 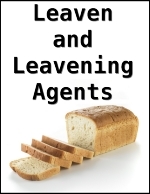 Leavening agents are substances that are used to puff up or produce fermentation, causing dough to rise. Yeast, bicarbonate of soda (baking soda), and baking powder are such substances. Leavening can also refer to "sourdough" a naturally fermenting yeast batter. Foods that can contain the above leavening agents are bread, rolls, buns, cakes, some crackers, pancakes, waffles, doughnuts, certain cookies, cereals, etc. If you are in doubt about any product, check the list of ingredients. When you are not sure about a particular food - don't eat it or have it in your house during the Days of Unleavened Bread. Ammonium Carbonate - also known as "Hartshorn"
Sodium Bicarbonate - also known as "Saleratus"
The breakthrough in chemical leavening agents occurred in the 1930's with the introduction of Monocalcium Phosphates (Ca(H2PO4)2). Note: It is not acceptable to remove leavening from your property if you just bring it back once the Feast is over. The lesson is to remove leavening entirely from our lives, which represents that which promotes corruption. To bring it back at the end of the Feast subverts the whole purpose of the lesson.